Leia is a beautiful 2 year old, American Pit Bull Terrier mix. At just 50lbs this sweet girl is a great size for most families...and her loving personality is sure to bring extra joy to your home! Leia is an obedient dog and knows her basic commands. She loves toys, is a great passenger on car rides, loves to go for walks, and is a champ at snuggling on the couch...plus she is house trained AND crate trained! Leia is good with children but, her forever family shouldn't have kids under 10 as Leia could easily knock them over by accident while playing. She is also good with cats and does well with the ones in her current foster home. Leia does not live with others dogs right now but, we imagine a great dog such as she would be good with most dogs as well! Leia has been with us since July and we would have thought, that with so many amazing qualities this girl would have found her forever home by now. Sadly, this is not the case and now it looks like her foster home will soon not be an option as well. Leia's foster mom is set to move in a month so, we would love to see her go to a forever home and avoid the confusion and sadness of being moved to a new foster. Leia is spayed, up to date on vaccinations, and micro chipped. All she needs is a home to call her own. If you think Leia would be the perfect fit for your family, please start the adoption process by completing the adoption application on our website at www.furfunrescue.org. 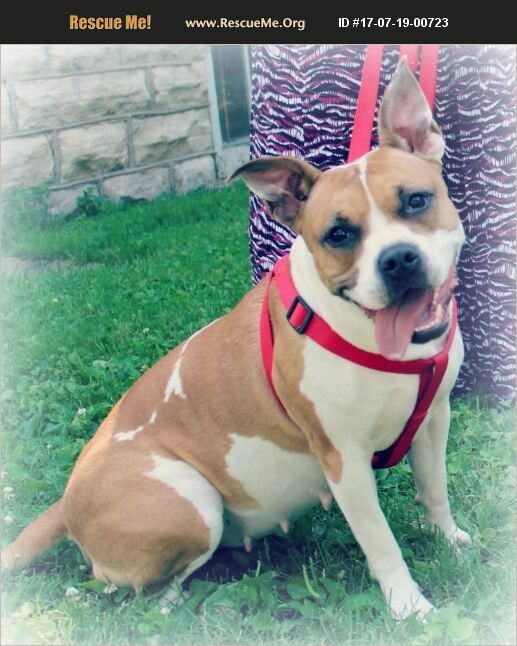 If you have more questions about Leia, please contact rox@furfunrescue.org or call 319-929-6657. Adopters within two hours travel time of Cedar Rapids, IA only, please. Indoor homes only. Adoption donation $200.